With the recent push towards a more eco friendly lifestyle more and more events and shops are doing away with plastic carrier bags in favour of reusual options. Over the last year I seem to have accumulated a few of these from various sources. I appreciate the sentiment and linen does make for a fantastic durable bag. My only quarrel has to be the designs that seem to have come my way. All these bags were free and consequently covered with advertising prints. This didn’t really inspire me to use them on my normal shopping trips so they’ve found uses in my home instead. The bag above became a handy place to store my onions in the kitchen. But the more I looked at it the more I realised that the design had to go. With the sewing machine out and some bondaweb I set about raiding my fabric store to applique things that seemed to fit my kitchen better. This was the end result. I’m very pleased with how it turned out, and I think my onion storage now looks quite smart. The only problem with applique is it’s so fun and easy to do that you start looking about your house wondering what else you can adorn. 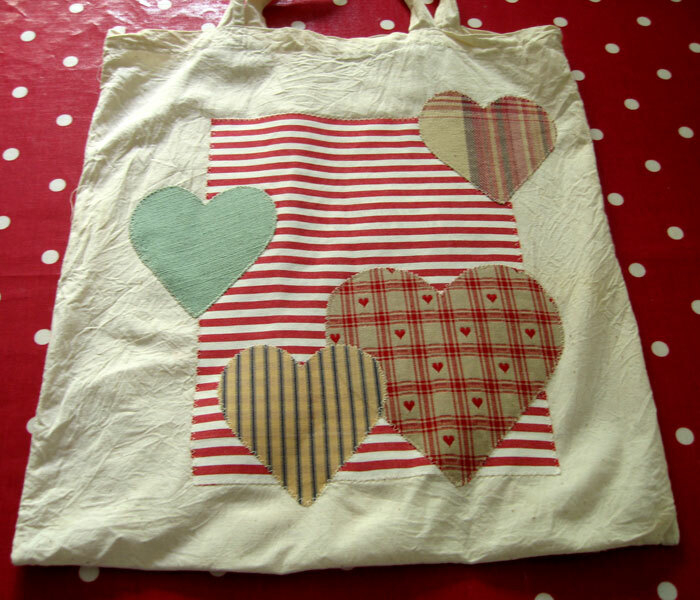 It’s also a wonderful way of using up those fabric scraps that weren’t big enough for a sewing project but you couldn’t quite bring yourself to throw away. I do think you have to be careful not to go over the top though. With this bag I cut out a lot of shapes and tried different placings before I commited to a final design. Next on the applique pile is a summer top, that is if the sun ever returns after all this rain we’ve been having. If you’ve never ventured into the world of applique there really is nothing to be scared of. All you need is some fabric, some bondaweb, a pencil and an iron. Draw a design on the paper side of the bondaweb (bondaweb is available on a roll from haberdashery shops or online). Cut out around design leaving a bit of a edge. Place the bondaweb paper side up onto your fabric. Press down with a dry iron. Cut out your design along your pencil lines. Peel the paper side off the bondaweb. Lay it down on your bag/top/whatever press again with a hot iron and hey presto it should be stuck! Next all you need to do is finish off your design. I favour a zig zag stitch running around the outside in a constrasting colour. Of course if you don’t have a sewing machine a simple running stitch works as well. Then stand back and admire your handywork! This entry was posted in Tutorials and tagged applique, bondaweb, linen, onion, tutorial. Bookmark the permalink. 6 Responses to Linen, Onions and Applique! Thanks, I'm a bit addicted now though, soon DH will be going to work adorned with cupcakes and flowers lol. Smart move, although I'm an avid 'bag-lady' I've never thought of re-vamping a freebie. It looks good! Hello Abigail – now following! this looks like a great blog.